Sicily is an autonomous region of Italy and the largest island in the Mediterranean Sea, with an area of 25,708 km² (9,926 sq. miles) and five million inhabitants. Sicily is a rugged and attractive island on the southern tip of Italy, and is one of the country's 20 regions. It is separated from the mainland region of Calabria by the 5km Straits of Messina. It can get very hot during the Summer, so it is better to visit during Spring and Autumn, whilst it is still quite pleasant during Winter. The house is situated between olive trees, carob trees ("carrubo", in italian), south-west oriented, facing the magnificent Sicilian sunset. 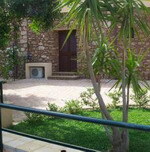 Panoramic, very quiet (it's an independent house), 1 km from the town and 5 kms from the sea. It can accommodate 4 people, with an equipped kitchen, bedroom, living room with a sofa-bed, bathroom, shower, washing-machine, veranda, reserved free parking. To start you off, you will find a complimentary basket of essentials (such as jam, cheese, butter, milk, coffee, tea, buns, orange juice, salt and pepper, organic olive oil, fruit, bread, buns and water). The property dates from the 18th century during the "Kingdom of the Two Sicilies" is owned by the same family since 1830, the new country home which originally had only one storey, has undergone many changes it has been carefully restored throughout in the last decade. Verdetecnica is conveniently located 1 Km. out of town on the top of a small hight with a splendid view over the countryside. The site is in fact a panoramic terrace overlooking a wide range of mountains on one side and the sea coast on the other side. Verdetecnica offers 6 totally furnished apartments with well equipped kitchen and private bathroom, ranging in size from one to three bedrooms. The apartments are of the highest standards with all conveniences, furnished with many authentic and original pieces, fully heated, air conditioning, Hi.Fi, Cd players & sat. Quiet flat of about 75 sq. mt in an ancient building ('800) completely restructured in 2006. Sleeps 5+2. 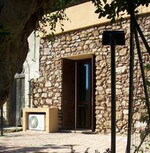 The entrance is from our private path, in the garden, deck chairs for exclusive use of guests. The layout of the apartment is simple: The entrance of the flat takes you directly into the open-plan living/dining area with a fully fitted kitchen corner and a bouble sofa bed, a lobby leads into the sleeping area which consists in one master bedroom and a bedroom with double deck beds and a single bed. The flat is comfortably furnished with wooden furniture . A large terrace (100 sq. mt.) comes with patio furniture. Air conditioning. Hi.fi, CD player, sat. TV. Also, House hold includes bed linen, towels and blankets. This unit has a well equipped kitchen with a good supply of crockery, cutlery, pans, etc. and private bathroom. Sleeps 7. Relax, SPA, carnival, temples, good food and wine, warm, safe and sunny environment close to the best beaches and city center. Air conditioned, TV Sat. The entrance is from our private path, in the garden, deck chairs for exclusive use of guests." 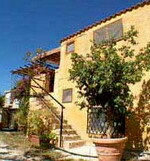 Hibiscus"sleeps 4+1: Garden style apartment with two double bedrooms, one of which on a mezzanine. Downstairs a small alcove with 2 single beds. 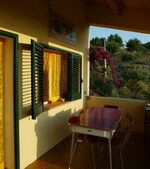 The flat is comfortably furnished with wooden furniture and Sicilian ceramics. This unit has a well equipped kitchen with a good supply of crockery, cutlery, pans, etc. and private bathroom. The terrace (50 sq. m) has a a large shaded area for dining and relaxing with flower-bed and patio furniture, for exclusive use of the guests.Central heating,air conditioner,CD player, Hi.fi,sat.TV. Also linen, towels and blankets. Sleeps 5. 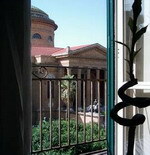 Charming studio apartment in Palermo center with terrific view on Opera theatre. Right in the center of Palermo, at third floor of an ancient palace in privileged and prestigious position, a wide studio with front sight of the Massimo Opera theatre. The apartment has an entrance with access to the small kitchen with gas stove and oven, the sink, the refrigerator and the necessary basic elements in kitchen for a short stay. From the entrance you can get to the great room with three areas: the sleeping zone with a double bed (brand-new mattress and net) and its bedside tables, the lounge den with two sofas and a low table and a dining area with the table from lunch and the chairs. From the sofas in the living room you have the frontal sight of the Massimo theatre and the window-door overlooking Piazza Verdi. Sleeps 2.